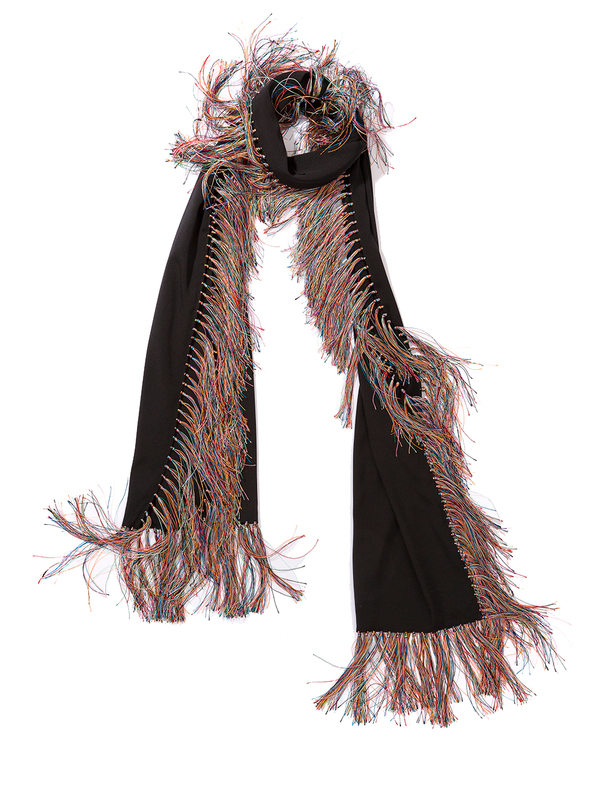 Rado-Hinks luxury scarves are statement pieces with a trans-seasonal appeal that is confident, cool, edgy and elegant. 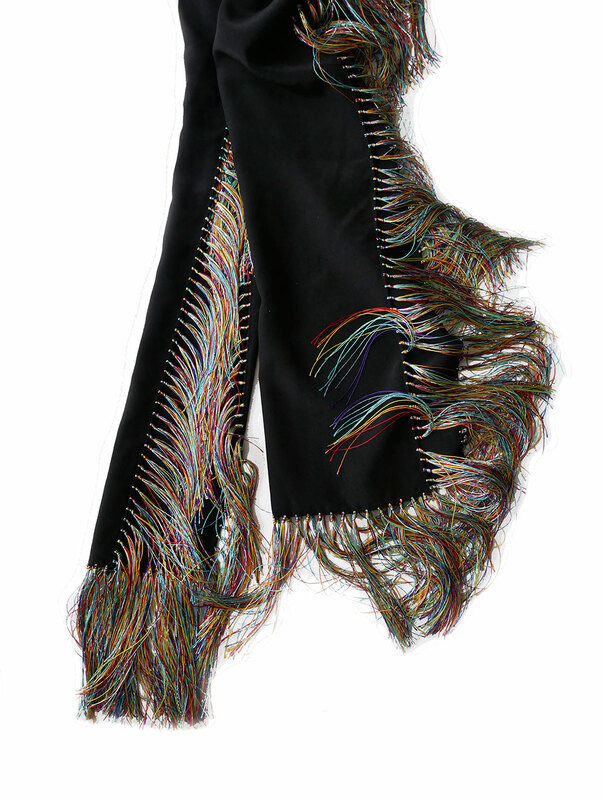 Fringed scarves are knotted by hand with over 350 individual, often multi-coloured knots and tassels that look at their best when moving on the body. The Ray Scarf is double sided, expertly sewn woven lurex and when tied with a single knot creates a literal flourish to any outfit. All fabrics are woven by one of Italy’s leading and most innovative mills and all finishing is done by hand in northern Italy. Rado-Hinks scarves are true luxury, both in material and in every hand made element. Rado-Hinks recommends these scarves should become part of your daily routine and worn often, with jeans, with camo, with a pea-coat or a velvet jacket. Rado-Hinks is created by Andrea Rado-Hinks. The Vivienne Scarf has to be worn to be believed. 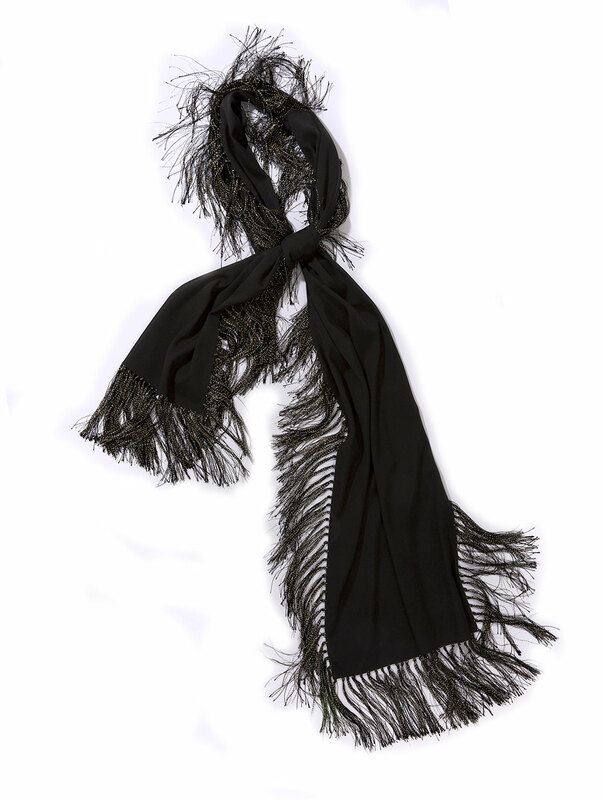 The scarf features over 350 hand knotted tassels edging its black silk body. The multi-strand and multi-coloured embellishment blends pink, mint, apricot, royal blue, pillar red, black, racing green, and orange strands. As the colours of the fringe combine at distance they create an almost neutral shaded mane around the scarf; up close they come into full chromatic focus. And moving on the body they create a gentle kinetic drama. The Vivienne Scarf stuns when worn with an all black look. Ditto with denim. Adds an edge, the personality of which depends on the wearer of course. Made in Italy by hand. Black 100% silk body (neither too shiny nor matte). 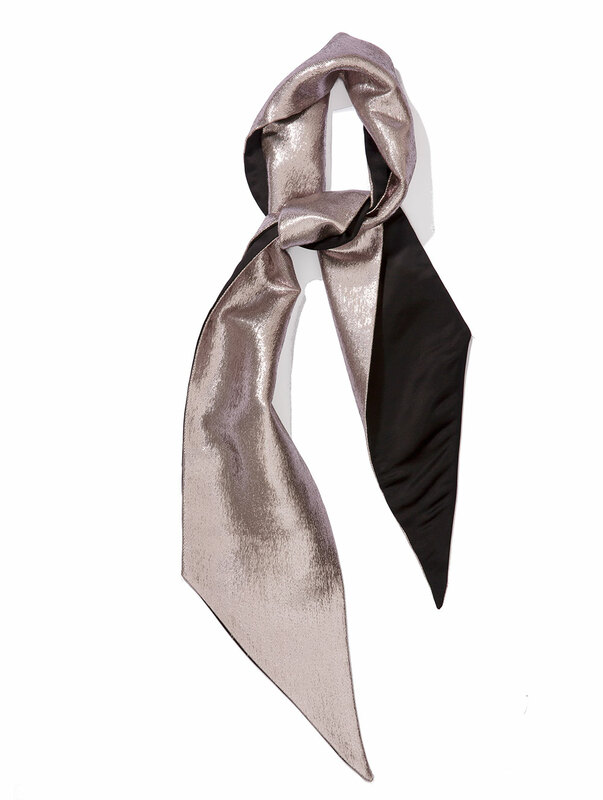 The Hope Scarf is made from Italian chiné silk taffeta. Chiné refers to an ancient and highly specialised printing technique where the threads of the warp are printed before the fabric is woven. This complex technique creates the blurred yet lustrous effect so appreciated by couturiers from the 1950’s Paris salons, often used in dresses of the 18th Century through to the fashion runways of today. The Hope Scarf features an incredibly rich and buttery cream taffeta ground with a soft violet shaded posy as the chiné print. Don’t be fooled by the pretty sounding design. With an exquisite army green hand knotted fringe around the full perimeter, the Hope Scarf has an edgy appeal that is equally at home at the festival, the party, the brunch or Sunday lunch. Made in Italy by hand. 100% silk warp printed body. 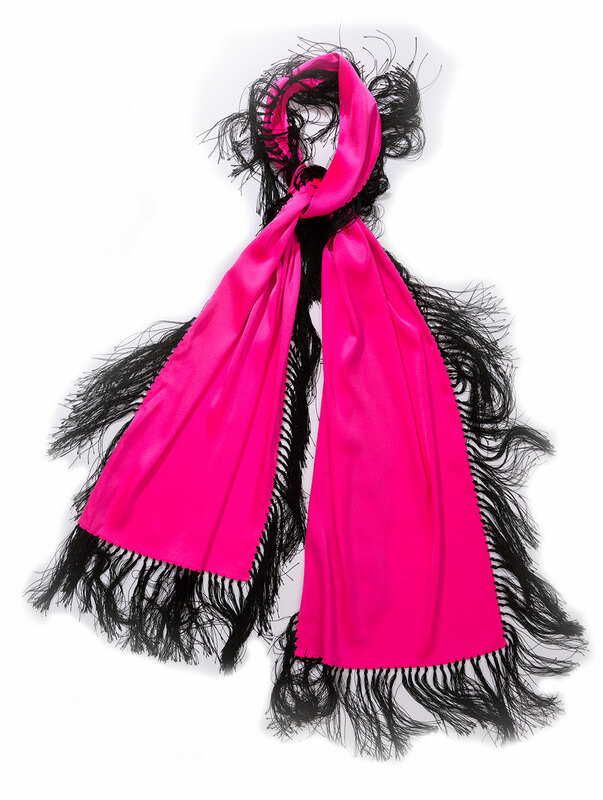 The Rosa Scarf is shocking in its conspicuous pinkness. The seemingly phosphorescent silk satin has a warm and bright lustre with a comfortingly soft hand. 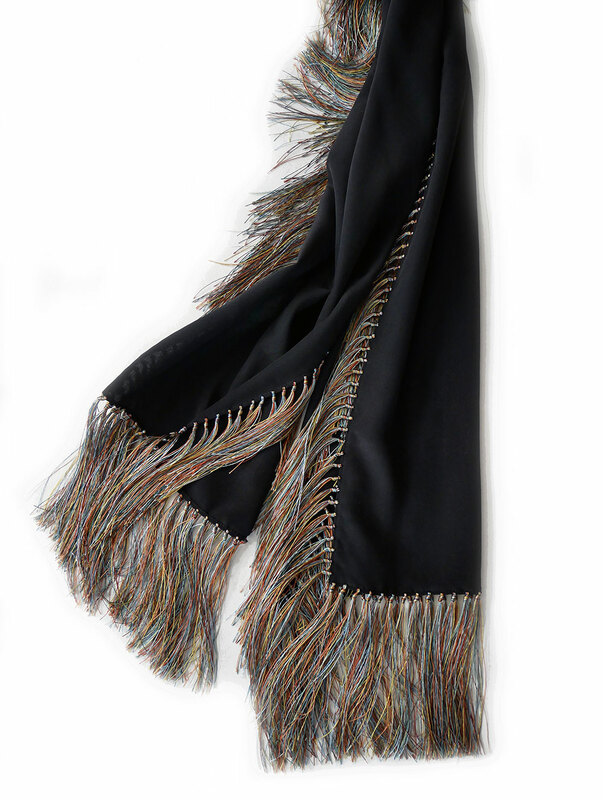 Decorated in the only conceivable way possible, the Rosa Scarf is fully edged in a jet black hand knotted fringe, more than 350 knots per scarf. The Rosa Scarf certainly isn’t for the faint hearted but you may be surprised by how easily it combines with a smart black winter coat as well as a wildly bohemian dress. Made in Italy by hand. 100% silk satin body. The Ray Scarf is stunning in its simplicity of sorts. Italian woven silver lurex creates a fabric that is like molten metal. Backed with black cupro for its slick, cool appeal, the Ray Scarf is expertly sewn into a double pointed exclamation of a scarf, that literally punctuates a ladies or indeed gentleman’s outfit. Made in Italy by hand. Lurex and silk woven body. Cupro reverse. 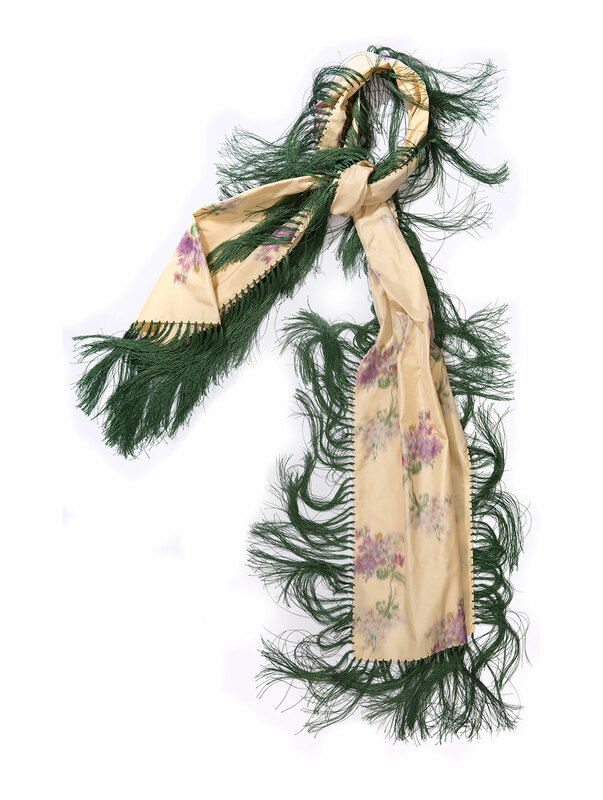 The Giulietta Scarf is an exercise in restraint if that is indeed possible in a scarf made in pure Italian silk and fully edged in gold and silver highlighted black hand knotted tassels. An excellent gift to self, BFF or hostess, its strength is in its classic nature combining black, silver and gold. Decorative yet understated, yet confident, its multi-personality gives it potential heirloom status. It should be worn with a frequency to make it the owner’s signature. Made in Italy by hand. Black 100% silk body (neither too shiny nor matte). Hand knotted tassels. The Proud Mary Scarf celebrates colour, the rainbow and pride. 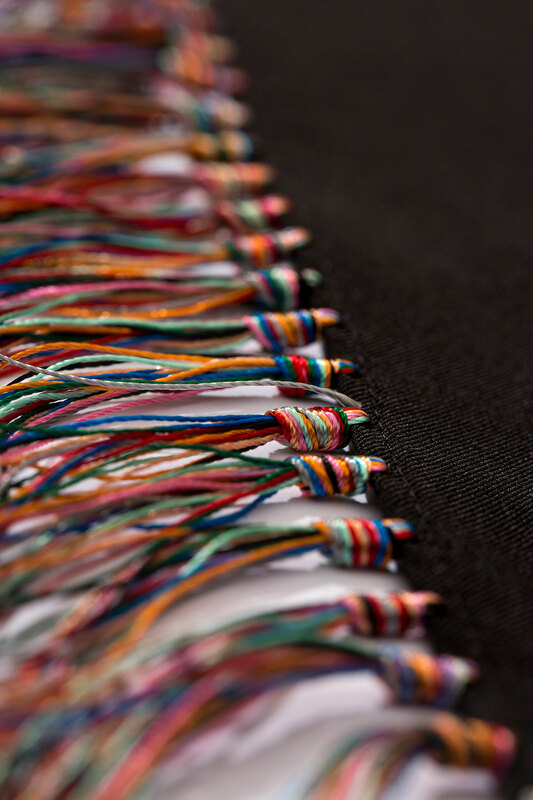 The black Italian silk is edged with over 350 individually hand knotted tassels in all the colours of the spectrum. Like the Vivienne Scarf, the Proud Mary Scarf is best moving on the body where the fringe creates a dynamic focus if you care to look. Please celebrate pride, compassion, kindness, understanding and friendship in liberal measures. Made in Italy by hand. Black 100% silk body (neither too shiny nor matte). The Blondie Scarf, so named for the appearance of its almost bleached out tassels, has similar qualities to the Vivienne, Proud Mary and Jean Genie scarves. The Italian silk body is fully decorated with over 350 hand knotted tassels and moves with the kinetic energy created by the wearer whilst walking, dancing or any other type of movement. Made in Italy by hand. Black 100% silk body (neither too shiny nor matte). 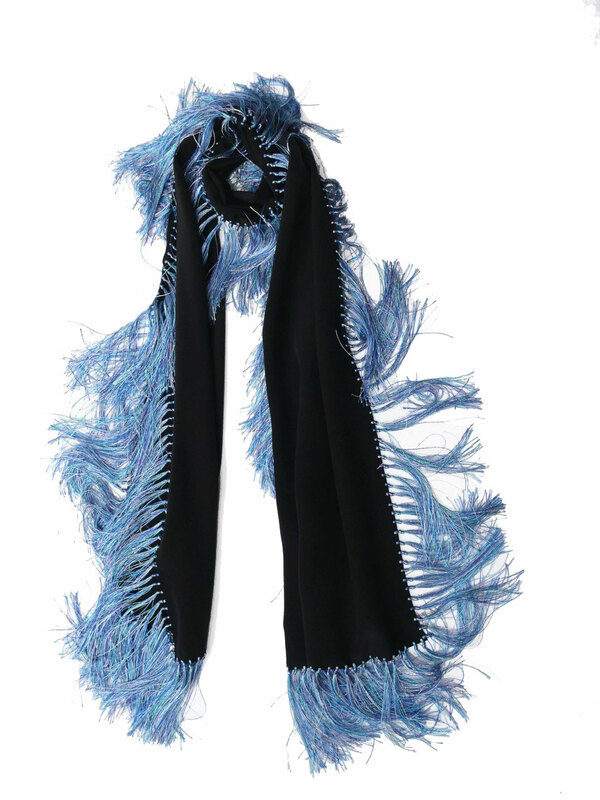 The Jean Genie Scarf recreates denim as fringe and what is better than classic denim and black. The Italian black silk body is dressed with a multitude of hand knotted blue shaded tassels. It can of course be worn with options other than denim and black. Co-ordinates well with blue eyes. And brown eyes. And all shades of skin. Made in Italy by hand. Black 100% silk body (neither too shiny nor matte). Andrea has worked in fashion since the mid 1990’s as both a fashion and textile designer for runway and luxury brands in London and New York, travelling frequently to Italy. Working closely with leading creatives and designing beautiful innovative luxury fabric has been a joy. Andrea has worked closely as the link between brands and Europe’s premier textile weavers and printers creating new fabrics. A colour expert with an innate love and technical understanding of textile products, developing new fabrics and translating concepts into textiles became the focus of Andrea’s career early on. In reality the fashion career started at an early age with patient sewing training from her mum and watching her grandmother knit and do needle point tapestry. Andrea’s portfolio of work includes women’s woven and knitted fashion design, accessory design including woven and printed scarves, blankets and throws, cushions, printed and woven ties, fabrics for luxury womenswear and luxury interiors fabrics and bedlinen. Please feel free to call or email Andrea with any questions. Ask Andrea a question about scarves, fringes, knots, colour, fabrics, textile design, vintage textiles, or similar! Rado-Hinks and Andrea Rado-Hinks assert the intellectual property and copyright of all designs. If you love my work then please get in touch and talk to me about it. Rado-Hinks would love to stay in touch with you and send occasional updates about scarves, and all things knots and fringe related.